On a vehicle, ball joint is a spherical bearing which can be rotated to almost all directions. Ball joints are installed on front wheel suspension to allow wheel to turn left and right, and allow suspension to move up and down. Ball joint is replaced if it has been worn and causing too much end play. It can be felt as too much free movement on the steering wheel, and it could be more than 1 cm free play, when the steering wheel is rotated. The occurrence of too much free play on the wheel can also be caused by the worn tie rod joint, in addition to the worn of ball joint, and can be also by wheel bearing worn. To ensure which part is worn, we need to jack the front wheel, and then shake the wheel by hands to the left-right direction of the vehicle. Check which component has too much end play: ball joint, tie rod, or wheel bearing. Some vehicle specification only allow a maximum end play of 3.18 mm (0.125 inches) as the wheel moved about. In the extreme condition, too much end play will cause wheel loose while driving. Measurements can be done by attaching end play micrometer on the outer lip / largest radius of the wheel. Worn ball joint usually can be seen as too much end play when the wheel is moved inward and outward of the vehicle. Bad wheel bearing usually looks like worn ball joint, which has end play to all directions : left-right and up-down. Worn bearing will produce a buzzing sound. For sedan with MacPherson strut independent suspension, a worn bearing noise can be heard clearly because the sound waves of bad bearing propagate easily toward cabin. While jeep with leaf spring suspension, usually bearing noise is not too loud even though the wheel bearing has already worn out badly. Ball joint replacement often faces difficulty in removing seized ball joint stud. Although the nut has been removed, stud oiled, and even beaten with a hammer, but ball joint stud still stuck. The stud could even be damaged because pounded by hammer. This procedure to remove seized ball joint with the jack, can be applied to MacPherson strut independent suspension that is popularly used on front wheels of sedan like: Toyota, Mitsubishi, Honda, Ford, Daihatsu, and many others. Jack vehicle on body frame, not on the suspension arm (swing arm), undo the tire. Put a jack stand under vehicle body so that car will be safely hanging without tire, lower the jack from car body. Later that jack will be used to release ball joint stud. 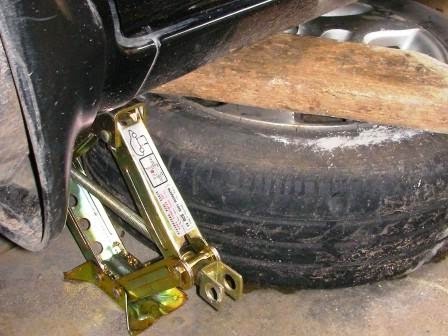 If you do not have any jack stand, you can use a spare tire with wooden block on the top. Do not just rely only with jack, because jack is less stable. 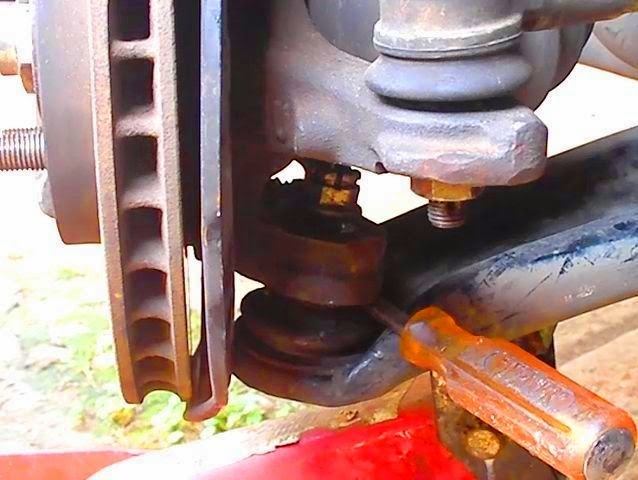 In my opinion, a tire with wooden block on the top is safer than a jack stand, especially when applying this technique of releasing ball joint stud as explained in this article. Because tire has wide surface that become the foundation, wooden block has also wide and soft surface to contact with vehicle lower body, making it more stable and less risk damaging the vehicle body. While jack stand has narrower foot and the upper part is also smaller and harder, making it less stable and can damage vehicle body. And of course a tire with wooden block is more economical than a jack stand. Some wheel design has convex face that is higher (protrude) than tire wall, that wheel convex face will be scratched if it is is touching the floor. As in the photograph, the wheel is facing up to avoid scratched face by the floor. Undo tie rod pin, loosen the nut, and remove tie rod. Tie rod relatively easier to remove than ball joint. Seized tie rod can be removed by tracker or by hitting it with a hammer on it's mounting. When hitting tie rod with hammer, make sure blow direction is not the same way of wheel movement when turning right or left, in order to avoid damage to the steering system. The photo shows a tie rod still attached, and we can see there is an extended part of tie rod mounting frame. 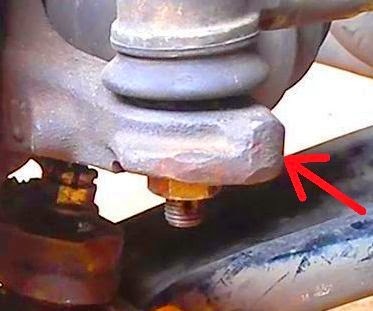 You can hit that extended frame by hammer in the direction of the red arrow if tie rod stud seized. On some vehicles ball joint can be removed without removing the tie rod. But considering safety, and because removing the ball joint requires a lot of effort and often have to be hit hard with a hammer. So to avoid steering system damage, tie rod should be removed before removing ball joint. In the video we can see ball joint is still attached, but the pin has been removed. Tie rod in the video had already been removed and repositioned back for safety, but not tightened. Remove ball joint pin from the nut. Loosen ball joint nut, but do not take it off. Turn the nut to move it to a distance of about 2-5 mm from the locked position. It is for safety when ball joint released, swing arm still can safely hanging. Ball joint nut in the video is still attached, but has been loosened. When the suspension arm (swing arm) is hanging freely without jack, we can see a narrow gap between swing arm and ball joint stud mounting. If the swing arm is lifted with a jack, then the gap between the swing arm and ball joint stud mounting will be widened. The higher it is lifted by jack, the greater the gap. When swing arm jack is lowered, then the gap will be narrowed back. When swing arm is being raised by jack, insert an iron bar in the gap, make sure that iron bar fits perfectly in the gap size. If needed hit that iron rod slowly by hammer in order to squeeze it into the gap. In the video I put a screwdriver in the gap between swing arm and ball joint stud mounting. I usually use a jack crocodile, appears red on the video. Other hydraulic type jack can do, as long as it is easy to raise and lower. When raising swing arm by jack, make sure the vehicle body is not floating. Add wooden block under the body, so the body does not slam down when swing arm jack suddenly lowered. Especially if using a hydraulic jack that can quickly lowered. If ball joint will be reused, such as: when replacing the wheel bearings, repair and replacement clutch and axle on the front wheel drive. Make sure ball joint rubber booth will not damage when inserting the iron rod / screwdriver. When screwdriver is already tucked steady, lower swing arm jack. The gap between swing arm and ball joint mounting will be narrowed, but because there is a screwdriver tucked in between, then the mounting will be pushed off the ball joint. If the ball joint has not been released, repeat the above procedure. Carefully hammer stud mounting, when swing arm jack is already lowered and screwdriver is pinched. Ball joint nut may also be hammered on its side. But hammering ball joint nut too hard would bent the stud, and if this happens it will be very difficult to remove the ball joint. In case ball joint nut is needed to be hammered hardly, then make sure nut position is close to maximum fit but not be tightened, or at least as low as 1 mm from tight position. As the principle of a lever, low positioned nut will be stronger to prevent stud bent when hammered from its side. On the video, we can hear crackling sound when the jack is lowering, it is the sound of ball joint stud released from its mounting.